At first, nothing lived on Earth. It was a noisy, hot, scary place. Choking gas exploded from volcanoes and oceans of lava bubbled around the globe…Then in the deep, dark ocean, something amazing happened. This is an exciting and dramatic story about how life began and developed on Planet Earth, written especially for younger children. 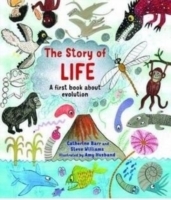 The authors explain how the first living cell was created, and how the cells multiply and create jellyfish and worms, and then fish with bendy necks, which drag themselves out of the water into swampy forests. They tell the story of the biggest creatures that have ever walked on land – the dinosaurs.